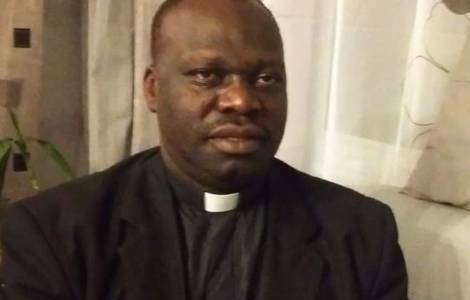 Bangui (Agenzia Fides) - "Monsignor Firmin was a key person in all the mediation processes to try and keep peace in Bambari, and was therefore known by everyone. His assassins cannot say they killed a person they did not know", local Church sources told Agenzia Fides in commenting the killing, on June 29, of Mgr. Firmin Gbagoua, Vicar General of the diocese of Bambari, in the center of the Central African Republic. "Mgr. Firmin was an extraordinary priest. A simple and very humble person, who was close to adults as well as the little ones, and above all he was a man who told the truth, who was able to make a very clear analysis of the situation", say Fides sources, who asked anonymity for security reasons. According to our sources, priests engaged in dialogue to avoid escalating violence are being targeted. "In recent months, all the priests killed or attempt to kill are inconvenient for those who want to destabilize Central Africa. In January they tried to kill Fr. Alain Blaise Bissialo, parish priest of Christ the King parish of Tokoyo and president of the Bangassou Peace and Mediation Committee, in the south-east of the country (see Fides 8/1/2018). In April, Fr. Joseph Désiré Angbabata was killed, along with some faithful in the assault on his parish in Séko, a village 60 km from Bambari (see Fides 24/3/2018)", recall Fides sources, that underline that even that of Don Angbabata "was a targeted murder. Don Angbabata was another man of dialogue, he was, a few months before his death, president of the Justice and Peace Commission of Bangui". In the case of Mgr. Firmin "the authorities have not yet officially recognized which armed group raided the Episcopate and killed the Vicar General". "For a year or so the authorities and the UN had said that Bambari was an unarmed city ("Une ville sans armes"), but this was never true", added Fides sources. "After the attack that the city had suffered in May (see Fides 21/5/2018), Mgr. Firmin had denounced that weapons in Bambari were still there, hidden in houses, and that armed robberies took place every day. Insecurity in Bambari is demonstrated by the fact that some districts of the city are controlled by armed groups, close to Seleka, who call themselves Mujaheddin". "The killing of Mgr. Firmin increases the feeling of insecurity", say our sources. "The commando of assassins managed to enter the Episcopate while a Gabonese contingent of MINUSCA (UN Mission in Central Africa) was a few hundred meters away. The assassins injured the guardian and mortally hit the Vicar General and then managed to escape, before the arrival of the Blue Helmets. We understand the level of insecurity that is being experienced in Bambari", the sources point out.